I started writing a post about how I organized our pantry a few days ago, and got more and more overwhelmed with trying to cover every detail. It was taking me five times more to describe the process than it did to actually organize the pantry! So I decided to break this post into several mini posts on organization, to share what went into this organization project (and typically goes with similar projects). *Simplify: Organization to me is more than moving things around. The main principle that I keep in mind is simplifying and keeping stuff to a minimum. I have been amazed at how little we need for every day life– it is a very liberating feeling. I am a firm believer in “less is more”! *Productivity: The time spent vs. the benefits gained is important. I keep my organization to 15- 20 minutes time frame at a time. Turns out, one can accomplish a whole lot in a a few minutes. I used to dread large-scale projects, like organizing a pantry, because of a time commitment it would require. Until I realized that I do not have to do it all in one seating: organizing in small “chunks” is how I have been tackling various areas around the house. *Form after function: Visual appeal is important, but not at the expense of my time (and money) budget. Once I have let go of the (self-imposed, Pinterest-induced) expectation to have all matching containers and pretty labels, I was able to move on much faster and show great progress. *Think outside the box: A space should be organized based on how it is used by your family, whether or not it fits the “default” expectations. For example, we keep silverware on top of the counter instead of in a utensil drawer, because it works better for us this way. We put our mudroom in the office, again because that is how we use our space, though I am sure that mudroom corner was not intended as such by the builder. Important note: A sign of effective organization is that the organized space stays organized long-term. Most of my organization projects turned out to be easy to maintain, again, due to the key points I just described. And if something is not working, it is tweaked. 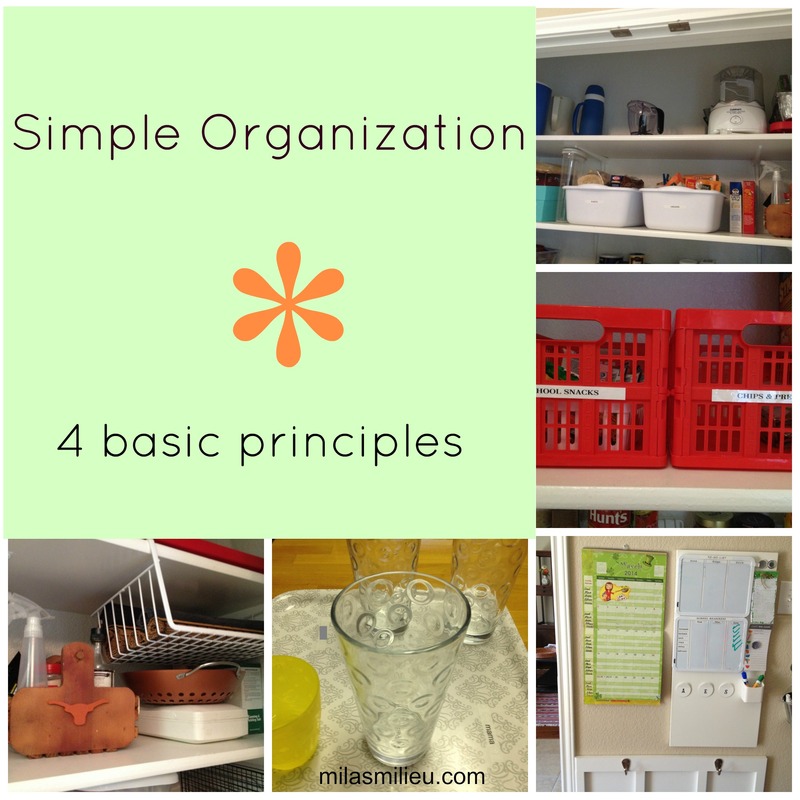 Organization does not have to be daunting and/or expensive, with the help of these principles. It is totally doable on a small budget and within the limited time that we have. I have been able to make good progress with organizing our house (though I have WAYS to go!). I already shared in detail how I organized our silverware and water glasses. I will be sharing my pantry and other areas in the future posts. Excellent advice! I am guilty of not simplifying…I know we don’t need half of what we have. I did start a big basement organization project, but need to get back to it and FINISH! I have re-shuffled where things go in the kitchen many times to better suit how we live. I need to take your advice and do little chunks at a time. Thanks! Hi Amy! Dripping water hollows out stone:) Things get done a little bit at a time here, instant gratification is a big motivator for me. Good luck with the basement organization, I hope you share the results. Have a wonderful Mother’s Day! I LOVE this post – of course! I so agree with doing organizing in small chunks and that true organization is systems that can be maintained long-term. Fantastic points! Hi Mila! These are the exact things I consider when I organize a space. I especially love the part about “organizing in chunks.” The big picture is so overwhelming. I am catching up on email (I’m so behind…) and saw a question you asked about drainage holes in plant containers. I’m probably too late but I always drill holes in containers that don’t have them…if you over water or get a lot of rain sometimes the containers actually overflow! What a mess that is. I hope all is well and you are enjoying this beautiful month of May! Thank you, Ann! I am actually planning to plant the herbs this weekend, I already bought them and have been looking for right containers. Thanks for the thoughts on the drainage, I will drill holes in some basic plastic containers as well (gotta get familiar with the drill first:). We have been spending a lot of time on the back porch, it is the best time of the year for it in Texas. Sprucing up the porch one bit at a time!